Be the first to share your favorite memory, photo or story of Shawnie. This memorial page is dedicated for family, friends and future generations to celebrate the life of their loved one. 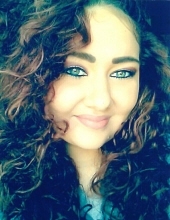 Shawnie Rose “Baby Girl” Silas-Grode, 20, Green Bay, passed away unexpectedly following an automobile accident on Friday, January 18, 2019. The daughter of Pauline Silas and Ross Grode was born on June 19, 1998. She always encouraged people to be their best. She was a natural born caregiver, and nothing meant more to her than being there for family and friends. Shawnie is survived by her parents, Pauline and Ross (Missy); siblings, Sebastian, Sasha (Ronnie) and Satiana (JoJo); her nephews C.J., Alex and Ayden, and niece Amyiia. She is further survived by her best friends, Alexcis and Mitchell, her boyfriend DaRon, and everyone in her beautiful blended family. She was preceded in death by her grandparents, Wayne and Rosie Grode, Grandpa Don Kaquatosh, Grandma Ila Roehrborn, Grandpa Jerald Silas, Uncle Alex, and other extended family members. Family and friends may visit at Ryan Funeral Home, 305 N. Tenth Street, De Pere beginning at 4:00 p.m. on Thursday, January 24, 2019. The Oneida Hymn Singers will begin at 5:30 p.m. and a sharing of memories will begin at 6:00 p.m.
To send flowers or a remembrance gift to the family of Shawnie "Baby Girl" Silas-Grode, please visit our Tribute Store. Hymn Singers 5:30. Sharing of Memories 6:00. "Email Address" would like to share the life celebration of Shawnie "Baby Girl" Silas-Grode. Click on the "link" to go to share a favorite memory or leave a condolence message for the family.